Yapung’s late charge saw him claim Champion Juvenile status by winning the Breeders’ Cup Stakes, the nation’s top race two-year olds at Seoul Race Park this afternoon. The colt, who had to come through heavy traffic before grinding down the field in the home straight, led home a one/two/three for his sire Menifee who has not only already been crowned Champion sire of this year, now looks set to be so for the foreseeable future too. For the second week in a row in a Stakes race at Seoul there were ugly scenes. This time it was Kim Hae Sun on outsider Storm Music, who was responsible for starting a chain of events that ultimately saw Jo In Kwen unseated from Rapide Bullet in the back straight. Like Cho Kyoung Ho last week, jockey Kim finds her season prematurely ended by the stewards. Yapung was able to avoid the trouble but still had plenty of work to do in the final two furlongs. Under Park Geum Man, he managed to find plenty and the manner of his acceleration suggests that there will be plenty more to come from him as a three-year old next year. Sire Menifee is now responsible for almost twice as much prize money than his nearest rival, 2011 champion sire Exploit. The sixteen year old stallion fell critically ill earlier this year and required a team of vets to be flown in to save him. Even with foals from the likes of Ecton Park, One Cool Cat and Officer soon to hit the track, Menifee is undoubtedly by far and away the KRA’s top breeding asset. In other news this weekend, there was a maiden victory for two-year old gelding My Key (Macho Uno-Worldly Pleasure) at Busan on Friday. My Key is a half-brother to US champion racehorse Game On Dude, through their dam, Worldly Pleasure. Worldly Pleasure was purchased by Jeju Island’s Nokwon Farm in December 2009 while she was in foal to Macho Uno but before Game On Dude started winning big races in the US. Just before the 2011 Breeders’ Cup (the real one, not the pretend one we had at Seoul today) she was sold on to Japan’s vast Shadai operation in exchange for a number of broodmares and a sizable wad of Yen. 11/1 chance Speedus won the Nonghyup Chairman’s Stakes at a chilly Seoul Race Park this afternoon in an ugly renewal which could have an impact on the season ending Grand Prix Stakes. The three-year old filly hit the front with two furlongs to run and kept well clear of the carnage caused by jockey Cho Kyoung Ho on favourite Chowon Yeoje near the furlong pole which caused jockey Bang Choon Sik to fall from his mount and for four other fillies to be severely hampered. Cho picked up a six meeting ban for his ride which will begin on December 1 and run until the end of the year. It means he will miss the ride on Tough Win if the five-year old tries to defend his Grand Prix Stakes title. Nevertheless, Cho can consider himself lucky after a very reckless ride. 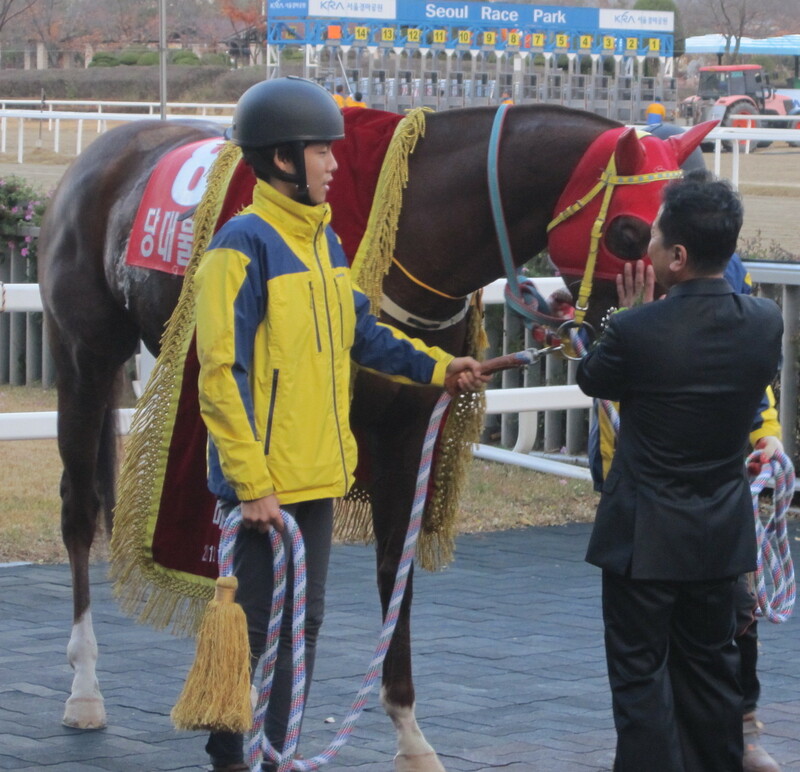 Using his stick a ridiculously high number of times even before the home straight, Chowon Yeoje appeared to finally have had enough and lurched across the track with a furlong to run. The winner though was a worthy one. Speedus finished on top for the fourth time in her twelve starts, six lengths clear of Dolpung Jilju. It was a second consecutive triumph in this race for jockey Choi Bum Hyun, who won last year on Cheonun, and his first trip to the Stakes winner’s circle in 2012. With a big ride potentially up for grabs in the Grand Prix, he may just get another chance. Dangdae Bulpae sent records tumbling as he cruised to a dominating victory in the President’s Cup at Seoul Race Park this afternoon. Not only was it the five-year old’s third consecutive win in Korea’s richest race, an unprecedented feat, it was also his ninth Stakes win and took him to close to 3 Billion Won in career prize money, neither of which have ever been achieved by any other horse on the peninsula. In the betting ring, punters sent Dangdae Bulpae off as the slight favourite in chilly, wet and blustery conditions, just ahead of Korean Derby winner Jiguem I Sungan. On the track, however, no-one even got close. Under Jo Sung Gon, Dangdae Bulpae hit the front as the field started to turn for home and once he did, the contest was over. Moon Se Young may have left Jigeum I Sungan’s late run a little too late but he was never going to catch the winner, with the margin four lengths on the line after Jo had eased down the defending champion in the final furlong. 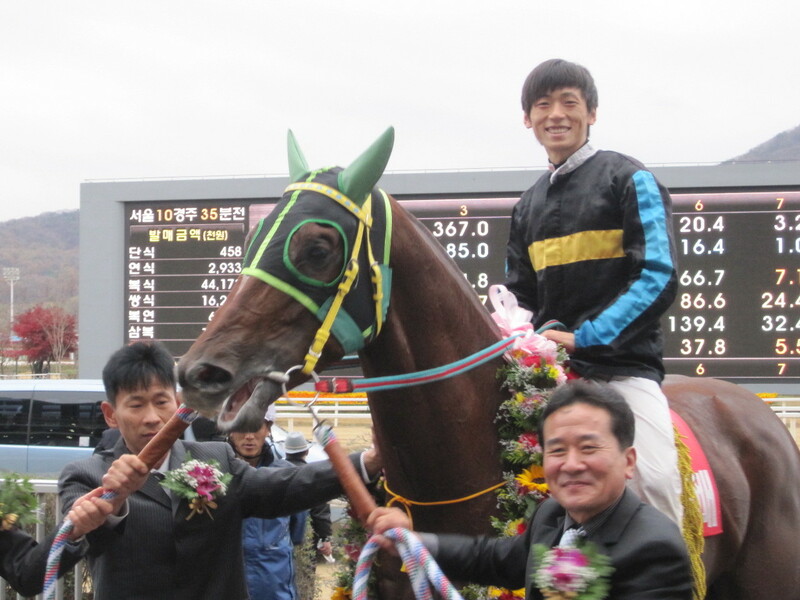 Jigeum I Sungan held off KRA Cup Mile winner Gyeongbudaero by a head to claim third. The victory was the eighteenth of Dangdae Bulpae’s career. As a three-year old he disappointed in the Cup Mile before finishing third in the Korean Derby. He made his breakthrough in the final Classic of the season, the Minister’s Cup before going on to claim his first President’s Cup. He finished the year on a low note, however, failing to get the trip in the Grand Prix Stakes, ending up in eleventh. Although Busan based, he returned to Seoul as a four-year to win the Ttukseom Cup before a summer wobble saw him taste back to back Stakes defeats. 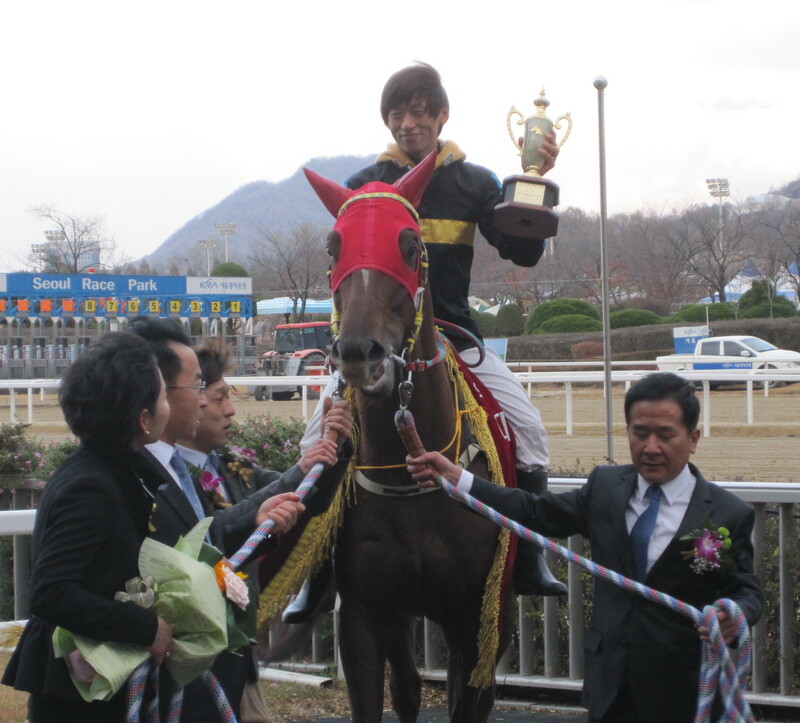 He was back in form for the President’s Cup, however, winning comfortably. Defeated by the late Mister Park early this year, Dangdae Bulpae beat an out of sorts Tough Win and a found to be lame Smarty Moonhak to win the Busan Metropolitan Cup and then claimed the Busan Owners’ Cup before returning to Seoul for today’s triumph. The only thing missing now is the Grand Prix. Uniquely, invites to run in the Grand Prix are decided by public vote. If Dangdae Bulpae’s name is on the ballot, he’ll surely be voted in in top place and, with no Mister Park or Smarty Moonhak and an inconsistent Tough Win, it will be difficult for connections to keep him away a second year running. Jigeum I Sungan has a shot at being there too. The Derby winner looks like he will be a very tough proposition next year. Gyeongbudaero too showed once again that he can compete among the best. There was a scare, however, for Rising Glory. Jockey Joe Fujii dismounted from the Oaks winner as soon as they crossed the line and although superficially no injury was apparent, she was sent for a full vet’s check-up. Also Ran: 4. Seungnuihanseong 5. Magnnifique 6. Powerful Korea 7. Nobel Pokpung 8. Special Win 9. Yeonseung Daero 10. High Point 11. Cheot Insang DQ. Golden Rose DQ. Rising Glory. Dangdae Bulpae will line up at Seoul Race Park on Sunday afternoon bidding to claim an unprecedented third consecutive victory in the President’s Cup. Though not as prestigious as the Grand Prix Stakes due its being restricted to Korean bred horses, the President’s Cup is the nation’s richest race. Dangdae Bulpae (Biwa Shinseiki) first won this race as a three-year old and, if he’s going to complete the hat-trick, he’s going to need to defeat all of this year’s Classic winners. Today at Seoul, the Turkey Jockey Club Cup was won by two-year old US import Watts Village (Forestry-Edey’s Village). The youngster beat 13 older horses by an impressive four lengths over 1800 metres. It was the second time in as many years that the race was won by a juvenile. Last year, Smarty Moonhak (Smarty Jones), currently sidelined indefinitely with tendinitis, stormed to a ten-length win that saw him ultimately become the first two-year old to enter the season ending Grand Prix Stakes. Whether Watts Village will even appear on the ballot for the Grand Prix is open to question, however, the manner of his gate-to-wire victory suggests that there is plenty to come from this young talent.